I like autumn. Autumn is my favourite time of year. I nipped out of the house in bare feet last week (taking rubbish to the bin or something like that) and the ground felt refreshingly cool. It had that 'nip' that enlivens the spirit and refreshes one's mind. Sun lovers may disagree but summer can be a trial - headaches, weariness and sweat. The wind is nos getting up. Clouds chase the sun and its light flickers incessantly between bright and dull. There's a hint of rain and a light and cheering breeze. The haws on hawthorn trees are already red. The sky mostly holds out blue. September! September 7th. Tree Following time! I'm still about as intermittent as the rain and about as dependable as autumn sunshine but I promise you I'll be back properly in mid-October. In the meantime . . . the box for your posts is here even when I'm not. This year has gone so fast, I can hardly believe it's September already. The trees are getting ready for autumn. utumn is my favourite season too and like you I'm not a great fan of summer. Lovely photo of the hawthorn, they look beautiful at this time of year when they are covered in red berries. Yours is a lovely description of autumn and what a stunning picture of hawthorn against the blue sky. I look forward to learning about your new tree soon. The coolness of autumn evades us in Texas, but not for long. Thanks for hosting! Summer? Just what is that!? Certainly not the weather for trotting out bare footed here this year. Super picture Lucy. It sums up the time of year perfectly. As usual thanks for hosting. I think this is one of the few times this year I've actually managed to post on time! Oh what a fabulous sky you have captured there Lucy. September is one of my favourite months of year - my bare tootsies have been exposed to the sun today albeit in sandals. Thanks as always for hosting this great get together of trees. I didn't really see any signs of autumn in Willow Canyon ... but I felt it coming! 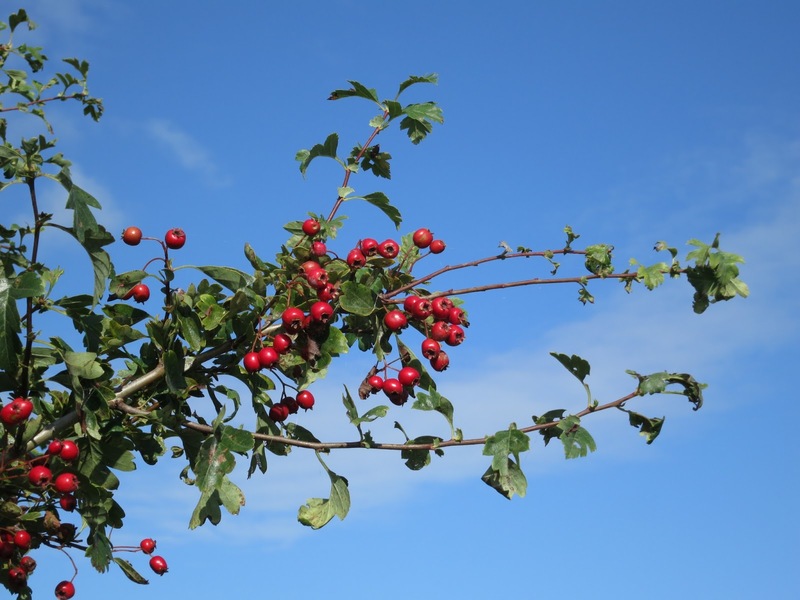 Lovely haws against a bright blue sky! My little cluster of wild trees will be happy to see autumn arrive! Lovely hawthorn berries - I always feel they are just on the pink side of red, if you know what I mean, and you have caught the colour perfectly. Look forward to more posts from you over autumn. My Paulownia is still delivering interest for me every month, so thanks for the excuse to visit it. What a beautiful picture of berries against an autumn sky! Autumn is one of my favourite times of year too. The light is low, warm and slanting, there is the promise of brisk walks on crisp days, and sometimes (if you are lucky) the smell of wood smoke in the air. But most of all, the autumn leaves on the trees turning a thousand shades of orange and falling crazily to the ground. Wonderful days. Thank you for this opportunity to look closely at these trees once again. Sounds like you've been having some of the same debates that I have about following a tree, however lovely, that isn't immediately convenient. I'm going to change in January, but for the moment I'm sticking with m hawthorn. Even if the haws are nowhere near as fat and red and healthy as the ones in your pic! Not too much happening with my tree now the fruit has gone, just waiting for the autumn show of pretty yellow leaves.